In 1963, Singapore’s first Prime Minister Lee Kuan Yew had a vision of turning the nation into a Garden City, committed to having clean land, clean water and clean air. As a result, today Singapore is ranked Asia’s greenest city by Green City Index. So how can you best enjoy the beauty of both “garden” and “city”? 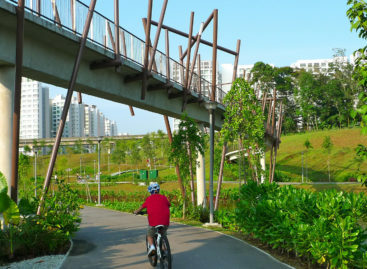 Go for a leisurely outdoor trek along the Southern Ridges- an incredible 10km stretch of natural trails and manmade bridges in the South of Singapore and connecting Kent Ridge Park, HortPark, Labrador Nature Reserve, Telok Blangah Hill Park and Mount Faber Park. Combining the latest in architectural design with the best of nature, the Southern Ridges won the prestigious Urban Land Institute Global Awards for Excellence in 2010 for being a stellar example of how to develop such an extensive and beautiful recreational space in a densely populated city. Not only is this walking trail home to a wide variety of flora and fauna, but it is also one of the best spots in Singapore to enjoy panoramic views of the city, harbour and the Southern Islands. Follow our walk in this video to see how beautiful The Southern Ridges can be! From garden workshops and birdwatching to historical battle sites and fine dining with a view, the scenic 10km Southern Ridges trail offers a huge array of things to see and do. Everything below is listed from north to south, starting off at Kent Ridge Park and ending at Harbourfront. 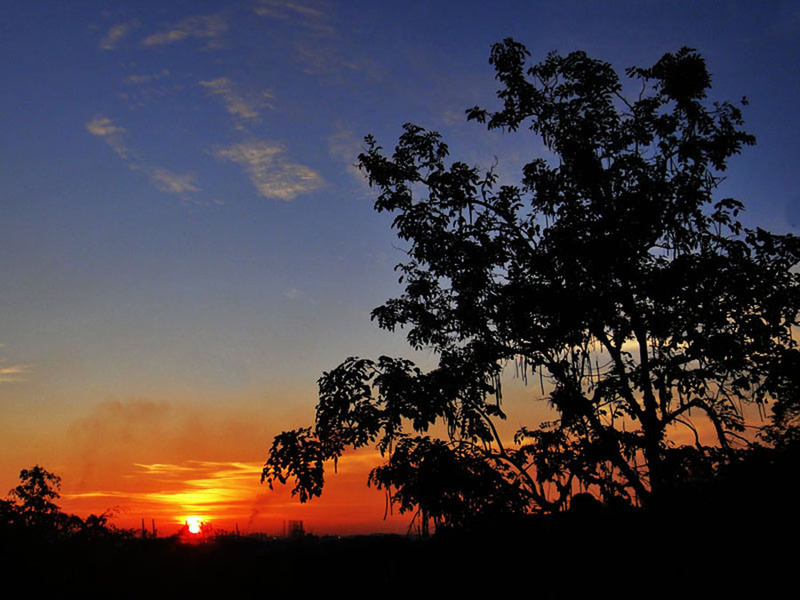 If outdoors is where you like to be, definitely also give camping in Singapore a try! 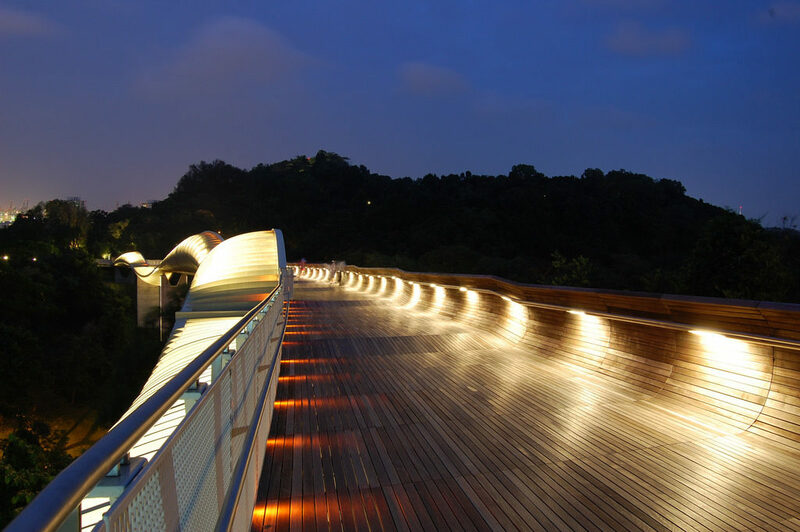 Enjoy a leisurely stroll across this 280m elevated wooden boardwalk connecting Kent Ridge Park to HortPark. The walk cuts through the Adinandra Belukar, a distinct type of secondary forest that regenerates after exhaustive agriculture exploitation. 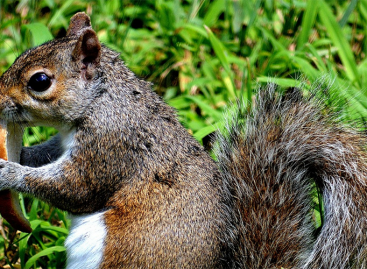 Here, you’ll see a rich variety of flora and fauna as well as squirrels, lizards and birds in their natural habitat. HortPark is Singapore’s horticulture paradise for those with a green thumb. This 9-hectare park is a one-stop center for gardening-related recreational, educational and research activities. HortPark has a series of themed garden displays, such as Water Gardens, Edible Gardens, and Pitter Patter Potter Garden to learn about various planting methods. Look out for their monthly Gardeners’ Day Out event, which includes a farmer’s market and food bazaar (selling edible items from people’s own gardens! ), guided tours and seminars, as well as interactive gardening workshops. Immerse yourself in the sights and sounds of native birds. A project sponsored by STMicroelectronics, the Singing Forest in HortPark was launched in 2010 to enhance the already-rich biodiversity of the area by planting trees specially selected from 38 native species to attract various species of birds. The best time for birdwatching is between 7am and 9am every morning. 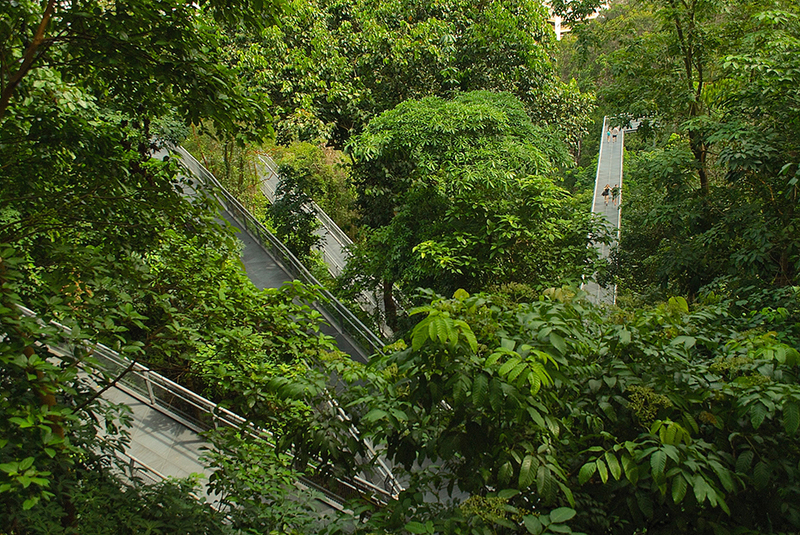 This elevated, 1.3km metallic elevated walkway linking HortPark and Telok Blangah Hill Park zigzags through nature, going up and over treetops to let you observe forest and fauna under your feet. Alternatively, you can get closer to nature by trekking along the Earth Trail, a natural dirt path that runs underneath and parallel to the Forest Walk. Located next to Gillman Barracks, the Forest Walk is an alternate ending/starting point of the Southern Ridges trek if you want to only cover half the journey. Nearby, you can explore Labrador Nature Reserve for fishing and barbecue activities by the sea. If you love exploring our country by foot, check our list of free walking tours! Themed “Recapturing the Past Splendour”, this hilltop park has been a popular gathering spot for trading communities since the early 19th century. Today, it remains a well-known area for visitors to practice taiqi, go jogging, or enjoy a meal at the park’s many picnic tables. 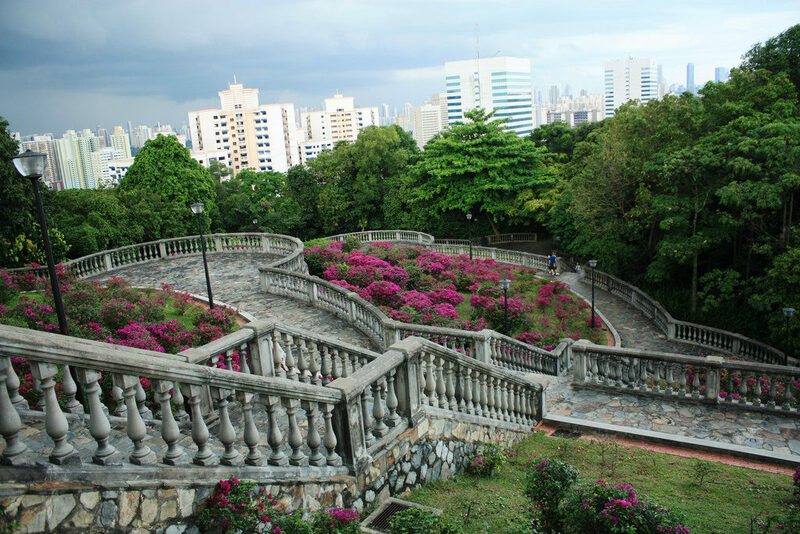 The highlight of Telok Blangah Hill Park is the Terrace Garden. It has a series of beautiful white semi-circular terraces reaching the top of the park where you can enjoy 360-degree views of Singapore. Dine at this elegant restaurant set in a historic two-storey colonial mansion overlooking the scenic Telok Blangah Hill Park. Built in 1918 by the rich Alkaff family of spice traders from Yemen, this house was not only a weekend retreat for the Alkaff family but also famous for hosting many opulent high society parties in the 1930s. Alkaff Mansion serves prosecco brunch on the outdoor terrace, cocktails at Bar 1918, high tea in the afternoon and gourmet indoor and alfresco Italian meals. In 2010, Sembcorp pledged $1 million to plant a massive forest of over 600 rare trees that originally dominated Singapore’s landscape before the onset of urbanization. Called the forest of “giants”, you will be awed by some of the 55 species planted here that can reach amazing heights of above 80 meters. Standing 36 meters above Henderson Road, this is the most iconic section of the Southern Ridges. It is also the highest pedestrian bridge in Singapore offering breathtaking panoramic views of the city. Henderson Waves’ artistic, distinctive wave-like structure consisting of a series of rolling wooden curved ‘ribs’ makes for a great photo-taking spot, as well as a good place to relax with a book or have a picnic. 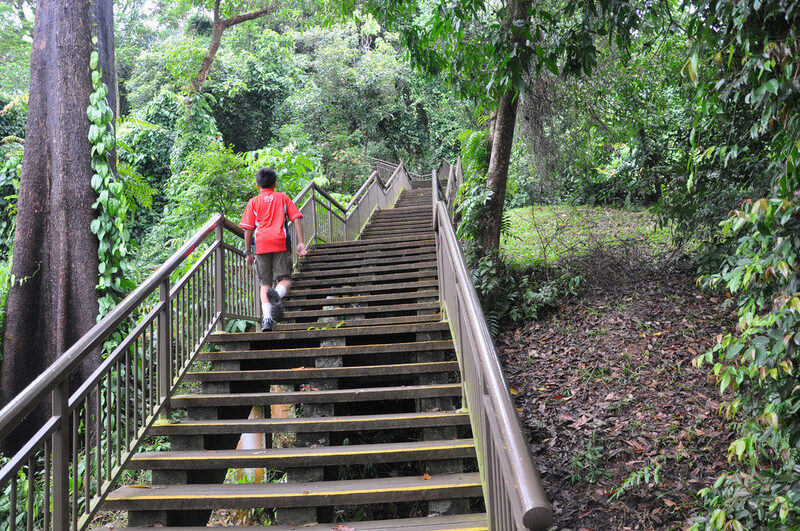 Trek up to Faber Point of Mount Faber Park, which is the highest point of Mount Faber (Singapore’s 4th highest peak) and enjoy views of the city through binoculars at the park’s viewing deck. As one of Singapore’s oldest parks, Mount Faber Park is also where you can learn about the country’s key historical events from beautifully carved wall murals. Plus you can take a photo here with a mini-Merlion statue against the backdrop of the harbour. Now that you’ve reached the highest point of the Southern Ridges, you can finish your journey with a relaxing and scenic cable car ride from Mount Faber down to Harbourfront MRT. 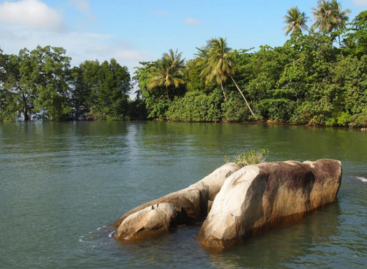 Or you could head even further down to Sentosa island where more adventures await! From your cable car, you will get to travel through a skyscraper and cross the harbour, as well as get an overhead view of the dolphins at Adventure Cove. If you’ve opted out of taking the cable car, congratulations! You’ve reached Marang Trail, the last leg of your journey. The downhill, 800 meter shaded footpath has a series of stairs winding through a forest rich with flora and fauna. Covering an elevation of 70 meters (the equivalent of a 24-storey building), the Marang Trail is the perfect way to enjoy the serenity of nature before finishing your journey at the bustling Harbourfront area. Sitting on the Upper Terrace of Mount Faber Park, this Western restaurant has amazing nighttime views of Singapore’s skyline. It is so popular for dinner dates and after-work drinks that reservations are almost always needed. If you’re a morning person, try their weekly brunches every Sunday from 11am to 5pm, which promises a huge selection of eggs, pancakes, rosti and sausages. Another restaurant with unblocked sights of Singapore’s harbour and Southern islands is Spuds & Aprons, is family-friendly spot at the top of Faber Peak serving Asian and Western dishes. Guests can feed fish in the restaurant’s beautiful koi pond, or tie “wishing bells” along the restaurant’s balcony railing (similar to the “love locks” along Pont des Arts in Paris, you can write meaningful messages or your deepest wishes on these little golden bells). Tip: Start your route from Kent Ridge at 5:30am or at 5:30pm, so you can catch the sunrise (7am) or sunset (7pm)at the peak of Mount Faber!